Talmudist of Safed in the sixteenth century; descendant of a family of Uceda, which, when banished from Spain, settled at Safed. Samuel was head of the Talmudical school which was conducted in the latter city by the liberality of the wealthy Solomon di Shiraz. On the death of Solomon, Samuel was obliged to become an itinerant preacher. In Constantinople he was befriended by Abraham Algazi, at whose expense he published his last book. 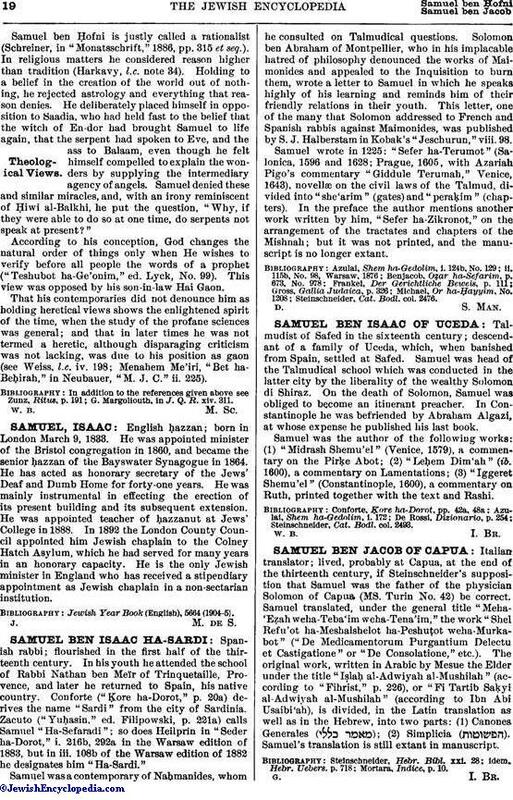 Samuel was the author of the following works: (1) "Midrash Shemu'el" (Venice, 1579), a commentary on the Pirḳe Abot; (2) "Leḥem Dim'ah" (ib. 1600), a commentary on Lamentations; (3) "Iggeret Shemu'el" (Constantinople, 1600), a commentary on Ruth, printed together with the text and Rashi. Steinschneider, Cat. Bodl. col. 2493.